Every year at this time we hear about the annual harvesting of maple syrup. Beginning in late February and lasting through early April, maple trees in the region of Vermont and Quebec are tapped for the gooey sap that will be boiled down to become maple syrup. Production dates back centuries, believed to have been initiated by Native Americans. It should be noted that pancake syrup is not maple syrup. The differences are significant. Maple syrup is a natural product and the highest quality can only come from the evaporation of pure maple sap. It takes about 40 gallons of sap to produce 1 gallon of syrup, so it is a precious labor, indeed. Pancake syrup is a manufactured product that consists mainly of thick high fructose corn syrup and other additives to replicate the flavor of maple. In the U.S., Grade A Light Amber Fancy is the lightest syrup and is what comes first in the tapping process. It has the most delicate flavor and costs the most. Then comes Medium Amber Grade A, Dark Amber Grade A and Dark Amber Grade B. The darker the syrup, the deeper the flavor. Maple syrup coming from Vermont will also have Vermont listed as part of the grade designation. 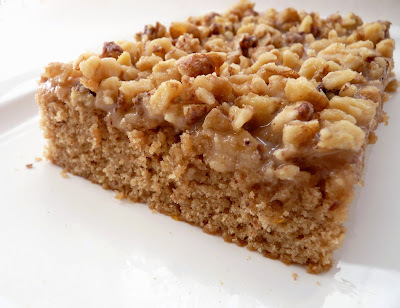 This Walnut Maple Cake is made with butter and the subtle flavor of brown sugar, cinnamon and nutmeg. It has a soft and tender crumb. The topping is made of toasted walnuts bathed in a butter maple glaze. 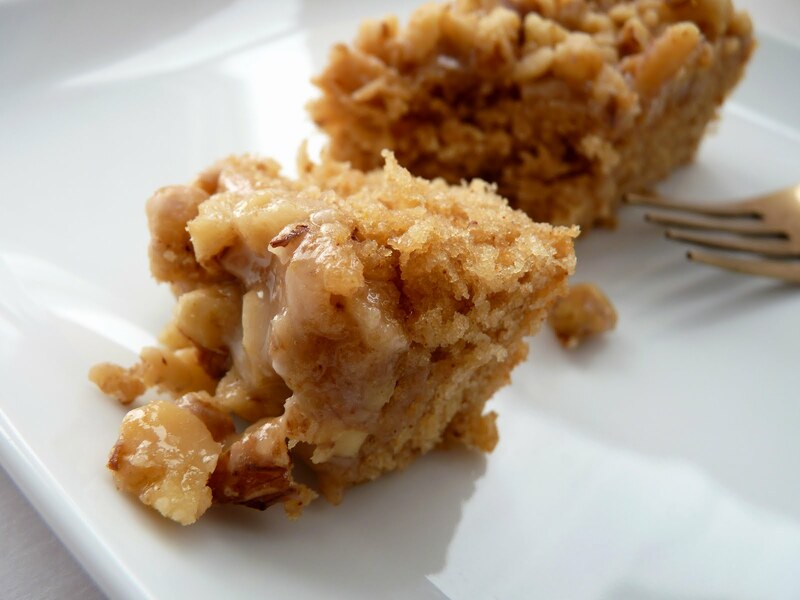 It’s a nice little snack cake to have when you’re in the mood for a simple treat. Enjoy this season of maple! 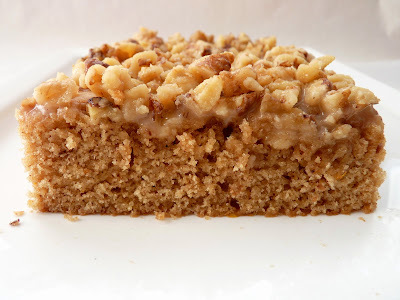 - You'll need 1 cup or about 4 oz of walnuts for the cake and the topping. 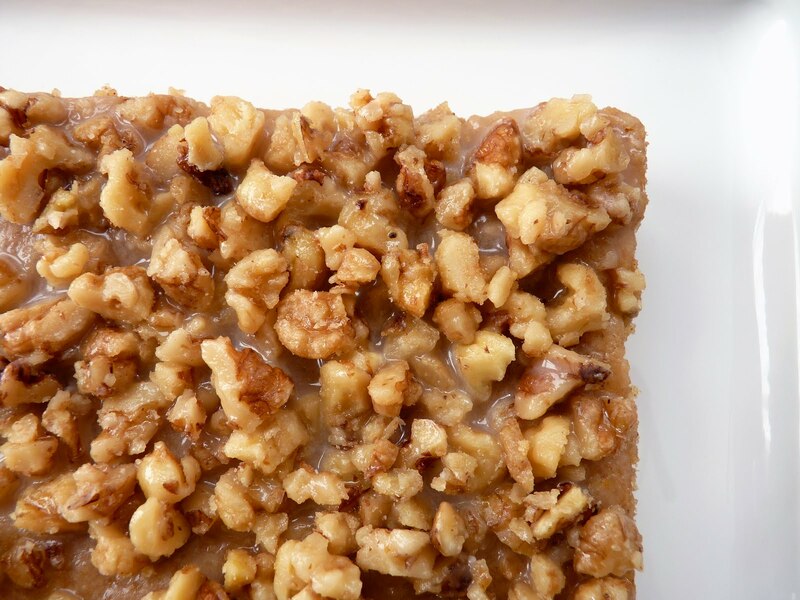 - To toast walnuts, place them in a single layer on a baking sheet at 350 degrees for about 10 minutes. They should be slightly fragrant. - A substitution for the buttermilk is 1/2 cup of whole milk and 1 1/2 teaspoons of lemon juice. Let it stand for about 5 minutes. - I use a stand mixer and mix only until the batter is almost thoroughly blended with just a bit of flour still showing. Then I take if off the mixer and finish mixing by hand using a rubber spatula. This helps to avoid over-mixing. - This bakes into a short cake, about 1 1/2” high. - I haven’t tried it but I think this would also be very good with toasted pecans. Preheat the oven to 350 degrees. Prepare a 9” x 9” square cake pan with a light coating of oil. Line the bottom with parchment paper, leaving an overhang on two sides. Place flour and walnuts in the bowl of a food processor. Process until the nuts are finely ground. Pour into a clean bowl and whisk together with baking powder, baking soda, salt, cinnamon and nutmeg. Cream butter and sugar until light and fluffy, about 3 – 4 minutes. Add eggs one at a time, blending thoroughly and scraping down the bowl after each addition. Combine the buttermilk, vanilla and orange zest. Add the flour mixture alternately with the buttermilk, beginning and ending with flour. Mix just until mostly blended, then take off the mixer and finish mixing with a rubber spatula. Pour into prepared pan. Bake for about 18 minutes or until a tester comes out clean. Place on a wire rack. For the glaze, melt the butter in a saucepan with the maple syrup over medium low heat, whisking constantly. The mixture will bubble up. Add the milk and confectioner’s sugar and whisk to blend. Cook for just about a minute and take off the heat. Add a pinch of salt, to taste, and the rum, if using. Stir in the chopped walnuts and toss to coat. Pour the warm mixture over the cake and spread evenly. When the glaze has set, gently lift the cake out of the pan using the parchment handles to assist in removing. Cool the cake completely. I HAVE MY OWN MAPLE SYRUP! This is the next dessert I'm going too make. Thanks. Walnut and maple is such an incredible combination. I normally make an ice cream based on these two ingredients but cake looks infinitely more sticky and delicious. Howdy, maple fans! Victoria, you probably get the best of some really incredible syrup in your region. Maple is such a distinct and complex flavor when you have the good stuff. Perfect flavoring for many things, including ice cream and custard. Your entries are the highlight of a good week-end beginning! I'm comment overdue because I want you to know you are appreciated! We have our own maple syrup also, and need a venue. We have made it for years for our three kids who love it but are now out of state. Not sure why my husband and I made the last batch..... we both find it a seldom used condiment. I made this night and it was really great!! I did make a couple substitutions, though. I didn't have walnuts, but did have pecans and since there was a comment from Pastry Studio about trying it with pecans, I thought I would. Also, I used bourbon instead of rum in the glaze. Otherwise, I made it exactly as written and it was FANTASTIC! The cake was very moist and, because of the spices and orange peel, had a very complex, interesting flavor. The glaze was really great, almost like candy! With some ice cream, it was a perfect dessert, but would work equally well with coffee or tea, brunch, etc. Thans for another great cake!! Kate, thanks so much for your wonderful encouragement. It means a lot to me. How incredible that you made your own syrup! I hope you enjoy this cake. saturday mike, so nice to hear your feedback. I can imagine the cake is terrific with both of your substitutions. I will try that next. As always, THANK YOU! I'm signing on for this one. It sounds incredible. What an exceptional cake! 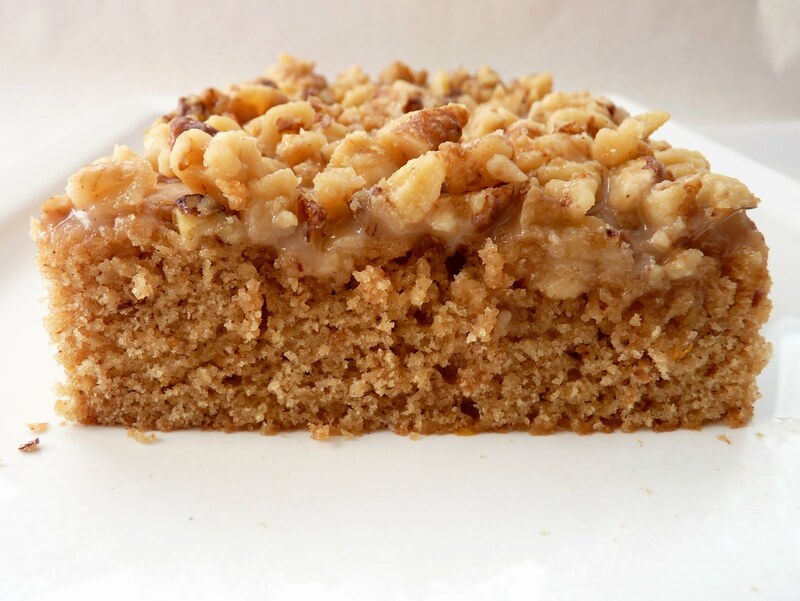 The pairing of walnuts and maple syrup is sumptuous, a lovely cake. This cake looks mouth watering! I'm going to make this tomorrow for mothers day, wish me luck, I certainly hope it tastes as good as it looks! shawn, I hope you enjoy your Mother's Day treat! It's easy to make and even easier to taste.